The world's notion is that to have romantic relationships is to have a sense of purpose . . . of belonging. Failure to engage one's self in intimate relationships—and eventually, marriage—is a reflection of one's social incapacity or lack. People these days think that if you don't have a girlfriend or a boyfriend, either something's wrong with you or you're gay. As a consequence, the pressure inevitably builds up, especially to the singles, leaving a lot of people wallowing in discontent at their current state of life. Both sexes are affected equally, I think: men are pressured to have girlfriends, so they act overly manly so they look like they have lots of testosterone in their system. Women, on the other hand, have to look beautiful, even to the point of sacrificing modesty. But what does the Bible say about singleness? Paul, one of Christianity's most beloved writers, says that singleness is a great opportunity to please the Lord. “To the unmarried and the widows I say that it is good for them to remain single as I am. . . . I want you to be free from anxieties. The unmarried man is anxious about the things of the Lord, how to please the Lord. But the married man is anxious about worldly things, how to please his wife . . . . I say this . . . to secure your undivided devotion to the Lord” (1 Corinthians 7:8, 32-33, 35). "[Singleness] is not a calling to extend irresponsible adolescence into your thirties. It is a calling to do what only single men and women in Christ can do in this world, namely, to display by the Christ-exalting devotion of your singleness the truths about Christ and his kingdom that shine more clearly through singleness than through marriage. As long as you are single, this is your calling: to so live for Christ as to make it clearer to the world and to the church." 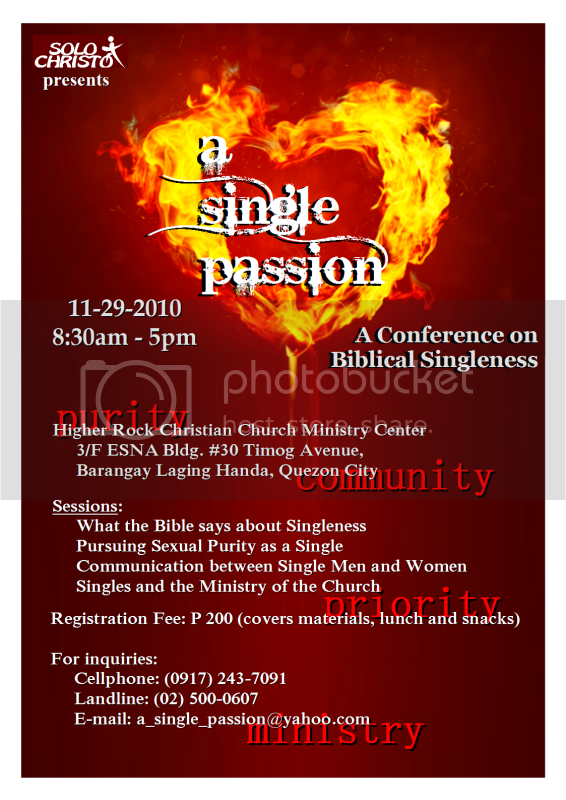 On that note, I'd like to invite you to A Single Passion: A Conference on Biblical Singleness. It's scheduled on November 29, a holiday, and it's going to be held at Higher Rock Christian Church in Timog Avenue, Quezon City. Registration is Php200, inclusive of meals and handouts. I'm posting the official flyer here. Here's a map, so you won't get lost. If you're interested, don't hesitate to get in touch with the organizers (see the contact details above). They'll be more than happy to assist you. If you're coming from UP Manila, drop me a line so we can go there together. Oh, so you don't get disappointed, I have to tell you this now: the conference won't have a special matchmaking segment. "Women, on the other hand, have to look beautiful, even to the point of sacrificing modesty." --> THIS. I love celibacy. We've been so programmed to believe that happiness lies in just being with someone. Motherhood and marriage are beautiful, but then so is dedicating your whole, unmarried life to our Lord--because in the end, sancity and happiness aren't measured by celibacy or marriage, but by how faithful we are to the specific vocation God has entrusted to us.